At Extons Real Estate we pride ourselves on being the number one go to agents for property management ! We ensure on finding our landlords the right tenant for their property by undergoing a number of checks and procedures and ensuring our landlords are satisfied with the applicants also prior to approval. Our office has zero tolerance for late rent, and low vacancy rates to ensure our properties are leased quickly and our landlords returns are maximised through consistent rent reviews and also our tenancy wish list system. We have the latest cloud based property management software to guarantee our landlords and tenants have 24/7 access to all their essential investment and rental information including statements, paid to dates, receipts and ledgers. 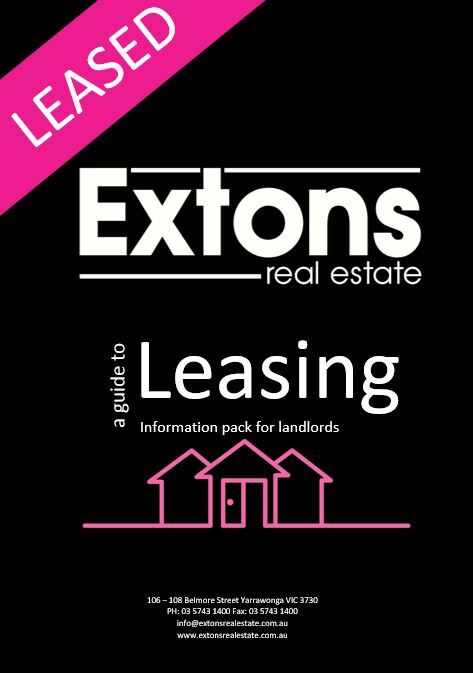 For more information about our property management services please contact us to discuss or request a copy of our Free Extons Real Estate ‘A Guide to Leasing’ for landlords information booklet here. Not happy with your current agent? Thinking of transferring your management ? Try our services for FREE ! Extons Real Estate makes transferring agencies a stress free and smooth process for both the tenant and landlord, because we do all the work for you! *If you are currently exclusively listed with another agency please disregard this communication.